The David Yurman store doesn't ship internationally so unfortunately you can't buy from them directly if you live outside the US. Many department stores in the US also stock David Yurman jewellery (e.g. Bloomingdales and Saks Fifth Avenue) but due to licensing restrictions, they're not allowed to ship the products overseas either. But you're in luck! Big Apple Buddy, your personal shopper, can help you purchase David Yurman designer rings, necklaces and bracelets direct from the official US store and deliver the items to your doorstep. We ship to most international destinations, including Australia, Austria, Azerbaijan, Bahrain, Belgium, British Virgin Islands, Brunei, Bulgaria, Canada, Chile, Costa Rica, Croatia, Czech Republic, Denmark, Estonia, Fiji, Finland, France, French Polynesia, Germany, Gibraltar, Greece, Greenland, Hong Kong, Hungary, Iceland, Indonesia, Ireland, Israel, Italy, Japan, Jordan, Kuwait, Latvia, Liechtenstein, Lithuania, Luxembourg, Macau, Malaysia, Maldives, Malta, Marshall Islands, Mauritius, Monaco, the Netherlands, Netherland Antilles, New Zealand, Norway, Oman, Poland, Qatar, Romania, San Marino, Saudi Arabia, Serbia and Montenegro, Seychelles, Singapore, Slovak Republic, Slovenia, Spain, South Africa, St. Lucia, Sweden, Switzerland, Taiwan, Thailand, the UAE, the UK, Vatican City, and Vietnam. 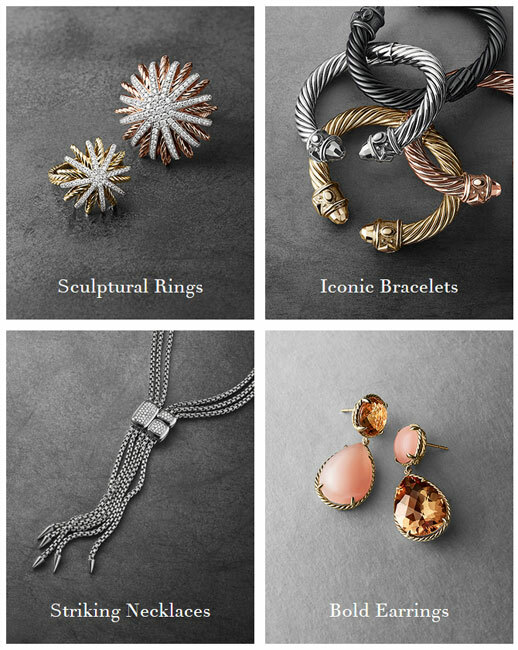 If you're interested in buying luxury David Yurman jewellery, simply tell us what items you're after and we'll put together a free shipping quote for you. It's that easy!